How long has it been since you've laughed out loud while reading a book? Too long, probably. Treat yourself to this little gem of a book: Things Your Dog Doesn't Want You to Know: Eleven Courageous Canines Tell All and you'll be guaranteed to chuckle and snicker and laugh out loud. So you think dogs are just dumb animals? Eleven clever canines, in a series of essays that switch from one dog to another, will set you straight and clarify just how smart and observant dogs really are. They interact and run their humans' lives a lot more than we might have known in the past. Meet Axelrod the yellow lab, who is helping to maintain the herb garden by "watering" it three or four times a day. Tinkerbell the chihuahua, is so fashion savvy that she "alters" the leather on her human's ugly shoes. Sarge the German shepherd does such a thorough job on his assignments that he keeps getting fired. Poor Moonbeam has been adopted by a messed up vegan New Age follower but still manages to find meat. We also hear from Dimples, whose humans have decided to include her sons Runt and Mutt Junior into the family, but are doing a very poor job of it. Charlie the schnauzer is living with six other dogs and states that his humans love dogs more than people only because they have no human friends. Young Gabby the dachshund is discovering boy dogs and catches up on doggie gossip during her walks. Sophie, on the other end of the life-cycle, is quite elderly and shares many years of wisdom. Orson the bulldog is a food connoisseur who admits that the shapes of his treats are not very important. He barely looks at them anyway. Bandana is a border collie who is very much in charge, except one thing - he can't stop chasing cars. He explains why. Rufus is a dreamer. He was trained as a hunting dog, but he has dreams. Jeff Johnson and Hy Conrad, the authors, have done a great job of capturing "dog" and sharing "dogginess" with their readers. 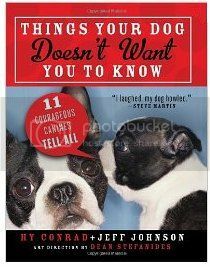 Things Your Dog Doesn't Want You to Know: Eleven Courageous Canines Tell All is available at amazon.com.